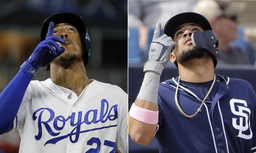 PEORIA, Ariz. (AP) San Diego Padres prospect Fernando Tatis Jr. and Kansas City Royals counterpart Adalberto Mondesi have never met, even though their life stories suggest a cup of coffee is long overdue. They would certainly have a lot to talk about. Each of their clubs is counting on their dynamic young shortstop to form the cornerstone of a rebuild that could push them back to the postseason. Both have roots in the Dominican Republic, have fathers that played in the big leagues, and both possess the kind of five-tool stardom at one of the game's premier position that leaves scouts and front-office executives in a tizzy. "On the field, off the field, how they handle themselves in the locker room - I saw both of those guys when they were 18, 19 years old in a big league locker room, and they fit right in," said Padres first baseman Eric Hosmer, who prior to San Diego had spent his entire career in Kansas City. "They have a different swagger, a whole different confidence," Hosmer told The Associated Press. "It's almost like they pictured this moment as a kid, being big league players." Tatis grew up bouncing around clubhouses in Texas, St. Louis, Montreal and Boston before his father, Fernando Tatis, wrapped up his 11-year career with the New York Mets. While never a star, the elder Tatis did bat .265 over his career, hit 34 homers in a season for the Cardinals and once connected for two grand slams in an inning. He broke into the big leagues at 22 years old, setting a bar that his powerful, precocious son could beat by two full years if he arrives later this summer. Or later this spring, for that matter. Junior has a valuable supporter to break camp with the Padres in third baseman Manny Machado, who signed a $300 million contract this offseason. The two could form a formidable left side of the infield, and Machado is so confident in the young upstart's future that he's embraced a return to third base even though he'd rather play shortstop himself. "That's a hell of an infield we'd have," Machado said. "He's a baller. He can play a little bit. I don't want him to blow up too much but he can play. He's a special player and he wants to get better, and he wants to prove he's the best player in the game." Tatis still has a long way to go in that respect. The 20-year-old shortstop hit .286 with 16 homers and 43 RBIs at Double-A San Antonio last season, but he has just 102 games under his belt at that level. So even though he's raking in the Cactus League this spring, the reality is some time at Triple-A El Paso makes sense. "We're a different team if he's in the lineup," the four-time All-Star said. "If he's in there, we're going to be a dangerous team, and we're all rooting for him to break camp with us." When it comes to Mondesi, there is no such question. The first player in more than 100 years to make his big league debut in the World Series, when he appeared in the 2015 Fall Classic as a 19-year-old, the son of Raul Mondesi has weathered a rocky start to his career. He was a staple among the Royals' top prospects for years, but his first two chances in Kansas City went so poorly that he was shuttled back to the minors. He hit just .185 in 47 games in 2016. He hit .170 in 25 games the following season. But everything finally clicked last year, when Mondesi torched the Pacific Coast League at Triple-A Omaha to earn another shot with the Royals. And this time Mondesi made good on it, hitting .276 with 14 homers, 37 RBIs and 32 steals in just 275 plate appearances over the course of 75 games. "We haven't met yet," Tatis said of Mondesi, even though their teams occasionally play each other in Cactus League games, and they work out just down Bell Road from each other in Arizona. The Padres camp in the Peoria and the Royals in Surprise. "I'd be glad to be compared to him," Tatis added. "He's already a really good ballplayer." Good enough to convince the Royals to let longtime shortstop Alcides Escobar sign elsewhere in free agency, and turn the full-time job over to a player they always considered their future. "He just made such great progress last year," Royals manager Ned Yost said. "I was really proud of him at the end of the year. When he first came up to the big leagues I was nervous about overusing him, because he's always been a bit injury-prone. I wanted to make sure I didn't pile on the days. "With a month to go he said, `You don't ask me how I feel. I'm going to play every single game. I'm ready,'" Yost continued. "That's a big step, to get yourself ready to go out there, because there is a lot of wear and tear on his body being that type of athlete. There's diving around. There's a lot of sliding into second base. There's a lot of quick-twitch movements that take a toll." Mondesi's father was an All-Star for the Dodgers early in his career, and proceeded to hit .273 over 13 seasons with seven different clubs. Those are solid numbers for anybody, but a benchmark that everyone in the Royals organization expects his son to surpass. There's at least one person in the Padres organization who expects it, too. "You just don't see the tools those guys have, especially at premium positions like shortstop," Hosmer said, shaking his head. "It's something that's extremely valuable. There's a reason both guys are so highly touted. They have tools that change the game from every spot. They check every box."